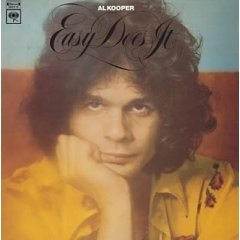 Al Kooper began the 1970s with being hired to produce the soundtrack for Hal Ashby's film The Landlord, which came out to mixed reviews. One of the songs he wrote for the film, "Brand New Day", was performed by The Staple Singers. Also in 1970 he re-united with Bob Dylan, acting as co-producer of his New Morning album. Easy Does It came out the same year. It was a double album, with quite a variety of different styles, including rock, pop, soul, blues and country. Included was some of the Landlord material, including his own rendition of "Brand New Day". It also featured covers of Seatrain's "Let The Duchess No", James Taylor's "Country Road", Ray Charles' "I Got A Woman" (slowed down in a drastic re-interpretation) and an intense twelve-minute jam of Big Joe Williams' "Baby Please Don't Go". Overall it was something of a mixed bag, but the highlights were fantastic.